The right information the right hands at the right time has a powerful effect. This “right information,” because of its powerful effect, has been likened to a “prophetic message.” Here I explain how to develop a “prophetic message” or national challenge from research information. I also created a short video that outlines this process. As far as I can tell, the term “prophetic message” was first applied to mission research by Jim Montgomery, who began his missionary career in the Philippines. In 1989 Montgomery published a significant book entitled DAWN 2000, which includes an entire chapter on “the prophetic message.” Although Montgomery was likely the first to apply the term “prophetic message” to church planting, he was standing on the shoulders of biblical prophets, other mission pioneers, and Jesus himself. The best example I’ve found of how to use research information to develop a prophetic message is found in Matthew 9:35-38. This passage significantly shaped Montgomery’s understanding of how to use research information to develop a prophetic message. Let’s familiarize ourselves with this passage. First, we see Jesus gathering data about his ministry area. “Jesus went through all the towns and villages…. He saw the crowds.” Following Jesus’ example, while doing ministry, you can gather data that will be used to mobilize others in the Body of Christ. Gathering data is sometimes called Field Research. Second, we see Jesus analyzing the data and drawing conclusions. I will say much more about this. And third, we see Jesus communicating the “prophetic message” to his disciples, calling them to action. 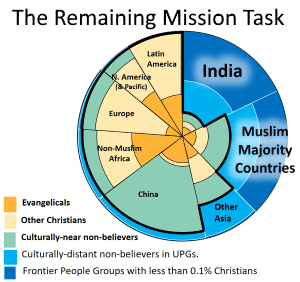 We will mainly focus on analyzing mission information as this helps us hear what the Spirit is saying to the churches (Rev. 2:7). Montgomery identified two categories of mission information, drawn from this very passage, that are building blocks for the prophetic message. We will call the first building block of information the Harvest Field. Note that is this comes from the last two words of the passage. This Matthew 9 passage guides us in analyzing the Harvest Field. First, Jesus noted that the harvest was plentiful. How did he know this? Well the previous verse mentions that “he saw the crowds”– multitudes of people were coming to Jesus. This indicates that they were receptive. It is important to determine how receptive people are to the Gospel. Realize that “receptiveness” can change over time and should be reassessed. Jesus also identified the needs of the people in his “Harvest Field.” A colleague pointed out to me that Jesus met the people’s spiritual needs, as he taught in their synagogues and preached to them the gospel of the kingdom. He also addressed their physical needs (healing every sickness and disease), he was moved with compassion by their psychological needs (as they were harassed and helpless), and he saw their need for servant leaders (for they were like sheep without a shepherd). So then, a second part of our analysis seeks to identify needs in the community we are seeking to impact with the Gospel. This reminds me of what Paul wrote to Titus: “Our people must learn to engage in good deeds to meet pressing needs, so that they will not be unfruitful” (Titus 3:14 NASB). Fruitful ministry meets people’s needs in a wholistic way – the same way that Jesus did. In further analyzing the Harvest Field, we want to find out the population of a region, identify people groups that live there and their religious affiliation. We will also want to know about the cities, towns and villages in an area and their respective populations. This requires us to have up to date demographic information. Fortunately, this kind of information is widely available today. Jesus points to a second building block that we need to develop a prophetic message when he says, “The workers are few….” Montgomery also refers to “the workers” as the Harvest Force. We can also think of the Harvest Force as the Church – with a Big “C”. Our research about the Harvest Force begins with gathering information about local churches but goes deeper to include missionaries, Christian organizations, theological training institutions – all the human, material and organizational resources that potentially can be mobilized to make disciples. When I assisted with the nationwide church census in Romania, we gathered information about the number of believers, average attendance, the church’s location, its denomination, the year the church started and contact information for the church’s leader. From this information we determined growth rates. And we identified communities without a single church – over 10,000 in the whole nation. Alongside this information we also compiled a Directory of Christian Organizations and Christian workers. This information was very helpful in determining what resources were available in various parts of the county to make disciples. Unfortunately, the FACTS alone are not sufficient to answer these deeper questions. We need to discover the FACTORS that help or hinder growth. To discover these GROWTH FACTORS, it is necessary to talk to the people closest to the situation and find out what they are doing – or better put, what God is doing. How exciting this is to hear their stories and discover how God is at work! We also discover what fruitful practices or methods workers are using. What we are doing here is known as a case study. Sometimes people have effectively used FUTURE TRENDS to clarify what to do. For example, in the Philippines, church leaders projected that there would be 50,000 barangays in the country by the year 2000. (A barangay is the smallest administrative area in the Philippines). Establishing a church in every barangay became their national challenge. Note that Matthew 9 concludes with a specific call to action. “Ask the Lord of the harvest, therefore, to send out workers into his Harvest Field.” In this context, strategic prayer represents the next step Jesus’ disciples needed to take. Prayer is always a good place to start. But it is not the only thing we must do. The Call to Action emerges as leaders of the Body of Christ wrestle with “what is it going to take” to accomplish what God wants. Oftentimes the call to action involves setting goals for a specific number of churches planted – or better yet, the number of localities or people groups to impact – training workers or sending out cross-cultural workers. If you have not done so already, bring together leaders of the body of Christ, to learn what insights the research uncovered, then to pray and to wrestle with what it is going to take to do what God wants. As leaders come to a consensus of what to do, it is time to share this call to action with the Body of Christ. Many have found it that articles, reports, booklets, prayer guides or short videos have a big impact. Publishing lists of locations without any church or maps are powerful ways to share needs with the Body of Christ and her leaders. When you know the facts, you have understanding. When you identify factors, then you have insight. When you know what to do, then you have wisdom. So, ask God to show you the great things he wants to do in the Harvest Field (Jer. 33:3). “Whoever has ears, let them hear what the Spirit says to the churches” (Rev. 2:7). I have briefly shared how to use research information to develop a prophetic message or national challenge. As you start to implement what you have learned, I believe you will find it helpful to have other resources to guide you. First, the Global Research Team of One Challenge, on which I serve, is available to help you understand the times and know what to do. It is our dream that God would raise up a team of mission information workers in every nation of the world to provide the Body of Christ with accurate, up-to-date information to guide Kingdom Impact on a permanent basis. Perhaps you will be a part of one of these teams. Toward this end, we offer training, consulting, coaching and mentoring. Write us at research@oci.org to explore how we can work together. Second, our website, www.OCresearch.info provides additional tips and tools to gather and analyze information to develop effective ministry strategies. This article links to resources that I have found most helpful in using research information to develop a prophetic message. May God give you wisdom, insight and vast understanding as you provide Body of Christ and her leaders with the strategic information needed to make disciples in His harvest field. On September 13th, Cathy and I attended the memorial service for Chuck Holsinger, one of the early workers with our mission, OC International. I don’t believe I’ve been at a memorial service where there has been more laughter as numerous people shared humorous anecdotes about Chuck. He had a great sense of humor; he also had great love for God and his country. We first met Chuck in 1991 in California when we were checking out OC. I remember what he shared in the seminar about support raising “I don’t raise support. God lowers it.” This piece of wisdom has stuck with me ever since and on several occasions I have passed it on to others. Chuck shared this need with two of his friends in business and received gifts to purchase an apartment for our team to use as an office, which was a tremendous blessing not only to our team but to the many other Christian groups, including a church plant, which used the office for meetings and office space. And Chuck was right! The economy did take off in Romania, and if we had not purchased an office when we did, we would not have been able to so so latter on. It was an especially lovely moment for us when we hosted a group from Taiwan at our office during a vision trip to Romania. It was like the Taiwan-Romania connection had come full circle. Chuck and his wife Betty visited Romania about a week after we first arrived in country. He had connections with a Pastor in a city on the Black Sea. So we all went to visit this Pastor in Braila. This was our first ministry trip, which involved a three hour train trip – cultural experience in itself. I was Chuck’s roommate. As we were getting to know each other, I mentioned that I began my education at Penn State. Chuck mentioned that he had a friend who was on the Board of Trustees at PSU back in the 1970s, who was praying for revival on the campus. Upon hearing this, I became excited to share with Chuck how God had answered his friend’s prayers. During the 1970s and early 1980s, one of the largest Campus Crusade chapters was at Penn State with about a thousand students involved. Other Christian groups such as InterVarsity and Navigators were also strong on campus. Little known to me when I arrived on campus in the fall of 1979, there was a “revival” going on among the students with strong foreign missions spirit. In the spring of 1980 Ralph Winter came to Penn State and held one of the early Perspectives Courses. The vision he cast took root among the students. I too caught the mission vision and left Penn State the following year to prepare for missionary service. Those who have closely followed the movement at PSU say that well over 100 students served overseas. One group of students went on to start Caleb Project, which mobilized a generation for missions. I am in touch with several who are still serving today, and I know many more that have a great heart for missions and are serving as senders. So it was a pleasure for me to share “the other half of the story” with Chuck. In retirement Chuck and his wife Betty settled in Upland, Indiana. That town might sound familiar, because this is where our family also landed five years ago. Chuck had quite a ministry in our little town. He regularly went to the Circle K gas station in the mornings to get a coffee and a donut – but his real motive was share a word of encouragement and the love of Christ with the people who came into the store. Chuck had a knack of turning fact conversations into faith conversations. Chuck was also a decorated WWII veteran who served in the Philippines. He wrote a book about his experiences, Above the Cry of Battle. The book is really his testimony of how God protected him in battle and enabled him to forgive the Japanese for the atrocities which he witnessed. When he was at the Circle K, Chuck was known to go to his car, pull out his book from the box he kept in the trunk and give it to a veteran or any other person who needed encouragement. I’ve heard many other stories of how Chuck was a light in our community. The Pastor officiating Chuck’s memorial service shared Hebrews 13:7 “Remember those who led you, who spoke the word of God to you and considering the result of their conduct, imitate their faith.” This is so true in Chuck’s case. He left us a wonderful Christ-like example of generosity, faith and service that we would do well to emulate.